The results, published this week in The Journal of Neuroscience, suggest that a young, developing brain has a striking capacity for functional adaptation. Bedny, an assistant professor in the Department of Psychological and Brain Sciences, studied 19 blind and 40 sighted children, ages 4 to 17, along with Massachusetts Institute of Technology cognitive scientists Hilary Richardson and Rebecca Saxe. All but one of the blind children were blind since birth. They monitored the children’s brain activity with functional magnetic resonance imaging while the children listened to stories, music or the sound of someone speaking an unfamiliar language. The blind children’s vision portion of the brain, the left lateral occipital area, responded to spoken language, music and foreign speech — but most strongly to stories they could understand. In sighted children and sighted children wearing blindfolds, that same area of the brain didn’t respond. The researchers concluded that blind children’s ‘visual’ cortex is involved in understanding language. Working with individuals who are blind offers cognitive researchers an opportunity to discover how nature and nurture, or a person’s genes and their experience, sculpt brain function. Though scientists have shown that occipital cortexes of congenitally blind adults can respond to language and sound, this study offers the first look at how and when the change in brain function occurs. 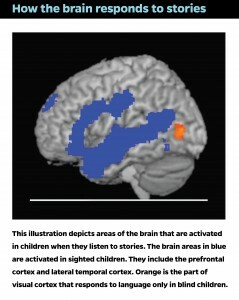 The team found the blind children’s occipital cortex response to stories reached adult levels by age 4. Because spoken language had colonized the brain’s visual region so early in the children’s development, the team realized the brain adaptation had nothing to do with a child’s proficiency in Braille. Scientists had previously guessed that brain plasticity for spoken language in blind people had something to do with Braille. Blind children’s occipital reaction to the other sounds, music and foreign speech, did increase as they aged. Bedny believes her findings could one day lead to improved therapies for people with brain damage. If someone had a damaged part of the brain, she said it could be possible to train another part of the brain do the damaged part’s work. This research was supported by the David and Lucile Packard Foundation and the Harvard/MIT Joint Research Grants Program in Basic Neuroscience.